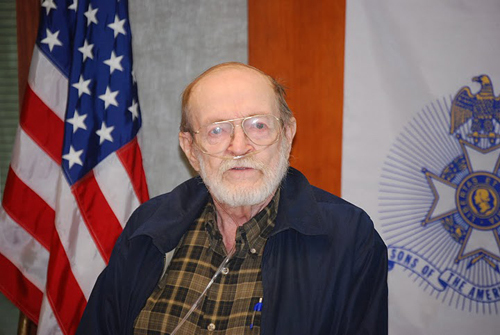 Pictured here is guest speaker, Compatriot George DeLapp, who spoke on the Carlson Raiders of the 2nd Marine Raiders Battalion during World War II on Saturday, April 9, 2011. 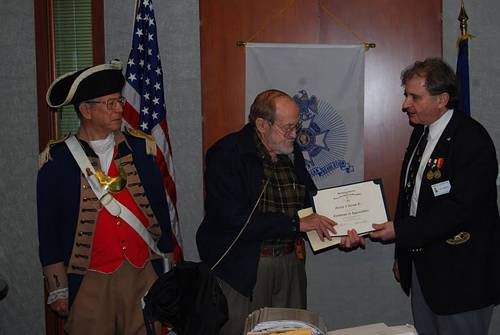 President Dirk Stapleton presented a certificate of appreciation to Compatriot DeLapp for serving as guest speaker. The Marine Raiders were elite units established by the United States Marine Corps during World War II to conduct amphibious light infantry warfare, particularly in landing in rubber boats and operating behind the lines. "Edson's" Raiders of 1st Marine Raiders Battalion and "Carlson's" Raiders of 2nd Marine Raiders Battalion are said to be the first United States Special Operations Forces to form and see combat in World War II. Left Photo (L - R): Compatriot George DeLapp. Right Photo (L - R): Major General Robert L. Grover, MOSSAR Color Guard Commander; Compatriot George DeLapp, and President Dirk A. Stapleton.